SIGN THE STOP KEYSTONE XL PETITION! THE LETTER BELOW WAS SENT TO THE WHITE HOUSE ON DECEMBER 10, 2013. IT WAS RUDELY & SUMMARILY IGNORED. I especially want to thank you for speaking with me afterwards to hear my request for a face-to-face meeting with President Obama to discuss stopping Keystone XL in its entirety – starting with shutting down the pipeline’s 485-mile southern leg in Texas and Oklahoma. I voiced similar requests to Vice President Biden, Denis McDonough, Cecilia Muñoz and Tom Perez when they visited the fasting tent, each of whom is copied on this correspondence. You invited me to send you a letter requesting a meeting, and outlining our objections to Keystone XL, which you offered to share with the President. In light of the fact that TransCanada began injecting oil into Keystone XL’s southern leg on Saturday, with plans to bring the pipeline commercially on line by January 3, it is urgent that we meet with President Obama before the end of the year to identify immediate actions the administration can take to prevent this project from delivering tar sands oil to Gulf Coast refineries. This letter is co-signed by several east Texas landowners whose rights have been violated by construction of the pipeline’s southern leg; a matriarch of the Great Sioux Nation whose treaty rights stand to be violated by construction of the pipeline’s northern leg; two prominent faith leaders; and two national environmental leaders. Given the urgency of this matter, your help in arranging a sit-down with President Obama before the end of the year would be most appreciated. Michael Bishop, Julia Trigg Crawford and Eleanor Fairchild are three of numerous landowners in Texas and Oklahoma who currently have sections of Keystone XL pipeline buried beneath their property against their will. Mr. Bishop is a Marine veteran who has several lawsuits filed to stop the pipeline’s southern leg, including one to revoke Army Corps water-crossing permits that were issued without public hearings, as required by law. His response to those who says it’s too late to stop the project is: “The pipe is in there illegally. That’s like arguing that if a burglar is already in your house, well, now they have a right to be there.” Ms. Crawford, a Texas farmer who describes the pipeline as “all risk and no reward,” is challenging TransCanada in court for abusing eminent domain laws to take her family’s property for private use and private economic gain. Despite the late hour, she also maintains, “It is not too late for President Obama to right this great wrong.” Mrs. Fairchild is a 78-year- old great-grandmother who refused to play ball with TransCanada and was subsequently arrested for “trespassing” on her own land and labeled an “eco-terrorist” by the company. She has since traveled to Michigan to see for herself the devastating effects of the three-year old Kalamazoo River tar sands spill (the largest onshore oil spill in U.S. history) and says, “Texans do not want this pipeline forced through their homes.” All three of these Texas landowners have vitally important information to share with the President about TransCanada’s abusive, deceitful and unjust treatment of U.S. citizens. Lakota matriarch Debra White Plume will share with the President the unshakable determination of the Great Sioux Nation to nonviolently resist any attempt by TransCanada to build the northern leg of Keystone XL across their treaty territory. Such construction would violate the Fort Laramie Treaty of 1868, which was ratified by Congress. The pipeline would also endanger the Oglala Lakota’s sole source of drinking water, putting the lives and health of their people at risk. A series of well-attended “Moccasins on the Ground” nonviolent direct action trainings have already been held to ensure that the pipeline does not cross treaty territory. Earth Policy Institute President Lester Brown will share with the President why America needs to be shooting for the moon with renewable energy, not drilling our way deeper into the climate hole with extreme fossil fuel projects like Keystone XL’s southern leg. A green energy “moon shot” will reinvigorate America’s economy and generate many more jobs than our nation’s current energy policies. The urgency of the climate crisis demands an emergency mobilization – similar to how the U.S. in 1942 restructured our industrial economy in a matter of months – to cut U.S. carbon emissions 80 percent by 2020. Friends of the Earth President Erich Pica will share with the President the myriad of risks posed by Keystone XL’s southern leg, including the potential for this continental carbon bomb to ignite catastrophic climate change. By evading a transparent and thorough review of the pipeline’s likely impacts, TransCanada has not only jeopardized the American people’s rights to clean air and clean water, but is also putting U.S. taxpayers at serious financial risk from tar sands oil spills. Father Jacek Orzechowski and Franciscan Action Network Executive Director Patrick Carolan, who embrace the teachings of St. Francis of Assisi and his call for the protection of creation, will share with the President the perspective of Franciscans and other faith leaders who object to Keystone XL in its entirety on moral grounds. a climate perspective, for the Obama administration to allow this project to go commercially on line. The President himself stated during a July 24, 2013 interview with The New York Times: “I’m going to evaluate this [Keystone pipeline] based on whether or not this is going to significantly contribute to carbon in our atmosphere.” As documented in a recent Sierra Club report, FAIL: How the Keystone XL Tar Sands Pipeline Flunks the Climate Test, the Keystone pipeline is a linchpin to more tar sands development, and increased tar sands development will significantly contribute to carbon in our atmosphere. The staggering reality is that Canada’s tar sands contain twice the amount of carbon dioxide emitted by global oil use in our entire history, with new tar sands mining techniques allowing up to 70% of that tar sands to be removed and burned. Climate scientists warn that fully exploiting this fuel source – which completion of Keystone XL’s southern leg would help facilitate – could trigger an uncontrollable over-heating of our planet, threatening civilization as we know it. The President also acknowledged during this same interview with The New York Times that this export pipeline is likely to raise U.S. gas prices and will generate very few jobs. Then there is the issue of pubic health and safety. 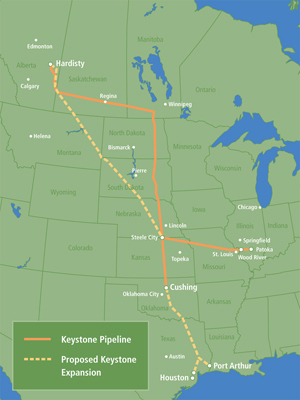 TransCanada’s Keystone I pipeline, built in 2010, leaked twelve times in its first twelve months of operation. Just as the President said about immigration reform that “it is not a question of if immigration reform will pass, but how soon,” so do we assert that it is not a question of whether the southern leg of Keystone XL will spill, but how soon it will contaminate any one of the hundreds of rivers and streams it crosses, or the Carrizo- Wilcox Aquifer, which supplies water to more than 10 million Texans. Alarm bells are ringing. Even before the installation of the pipeline’s 485-mile southern leg was completed, there were 125 excavations of Keystone XL pipe along a 250-mile stretch in Texas due to “anomalies,” including dents, sags and faulty welds. These weak spots in the pipeline pose the very real danger of leaks and spills. From a safety perspective, it would be the height of irresponsibility for federal regulators to allow this project to go commercially on line absent new inspections and a thorough investigation of TransCanada’s highly questionable construction and safety practices. Again, our request is for a face-to-face meeting with the President before the end of the year to identify actions the administration can take to prevent this project from going commercially on line. We look forward to the President’s response. I plan to remain in Washington, DC at least through the end of the year for the express purpose of this meeting. As I do not have a set physical address while here, I ask that I be contacted at tom@climatecrisissolutions.com or at 303-378-1364. Thank you for writing. I want you to know I take your thoughts about the Keystone XL pipeline very seriously, and I appreciate you taking the time to share them with me. Thank you, again, for your message — it will be on my mind in the days ahead. This fall, I will pedal the EcoWatch/Climate Crisis Solutions “Tell President Obama to Stop Construction of the Southern Leg of Keystone XL” petition 485 miles (the length of Keystone XL’s southern leg) from Cleveland to the White House. More than 7,000 people from all 50 states and many nations have already signed our petition, which is publicly endorsed by Daryl Hannah; Tim DeChristopher; Mariel Hemingway; Ed Begley, Jr.; Lester Brown; James Hansen; Tantoo Cr Cardinal; Michael Bishop; Julia Trigg Crawford; Randy Thompson; Julia Butterfly Hill; Paul Hawken, Debra White Plume; and many others. This fourth, and final, Ride for Renewables will conclude with a no-holds-barred press conference and peaceful action outside the White House demanding that President Obama immediately stop the construction of Keystone XL’s southern leg that is now 95% built and targeted for completion by the end of this year. In his June 25 climate speech, the president said, “Allowing the Keystone pipeline to be built requires a finding that doing so would be in our nation’s interest. And our national interest will be served only if this project does not significantly exacerbate the problem of carbon pollution.” The problem with the president’s statement is the Keystone pipeline IS ALREADY BEING BUILT in Texas & Oklahoma, with zero regard for carbon emissions or America’s interests. While he may still be undecided about whether to approve a permit for the pipeline’s northern leg, it is absurd for President Obama, or his political enablers, to pretend he has not made a decision about the Keystone pipeline, when he directed his administration to fast-track its construction in Texas and Oklahoma last spring. If not stopped, Keystone XL’s 485-mile southern leg will soon begin pumping more than half a million barrels of toxic tar sands daily from Canada to Gulf Coast refineries (see map below and to the right) WITH OR WITHOUT THE PIPELINE’S NORTHERN LEG. The map to the right shows how TransCanada will accomplish this by simply connecting Keystone XL’s southern leg to Keystone I (the orange line on the map) built in 2010. But for the fearless resistance of local landowners, and the heroic efforts of the Tar Sands Blockade and Great Plains Tar Sands Resistance, tar sands might already be surging across America’s breadbasket to Texas refineries, for export overseas. Despite being 95% built and targeted for completion in late 2013, the construction of KXL can still be stopped. Texas landowner and petition signer Michael Bishop has a class-action lawsuit filed against the U.S. Army Corps of Engineers to invalidate TransCanada’s permits and order public hearings on the pipeline’s route through TX and OK. On the ground, TransCanada has been scrambling to replace newly laid defective pipe along a 60-mile stretch in Texas, with calls mounting for an investigation and a halt to further construction. And then there is us, and we have yet to be heard. Rarely does such a clear-cut opportunity present itself to alter the course of history by simply doing what is right. Please join our growing people’s movement to stop the Keystone XL climate disaster by signing our petition today. Then join us outside the White House on Nov. 7 as we take a stand for our children, the next seven generations, and all life on Earth. Democratic President Barack Obama shrewdly delayed a decision on permitting the northern leg of the pipeline until after the 2012 election, but telegraphed his ultimate intentions by calling for the southern (OK-TX) leg to be fast-tracked. Republican Governor Mitt Romney, who also supported construction of the southern leg, said he would approve the northern leg on “day one” of his presidency. What would you do if a foreign energy company trespassed on your property, staked it out, and threatened you with eminent domain if you didn’t sell them easement rights to run a tar sands pipeline across your land? What if this same corporation recklessly put the health and lives of your loved ones in jeopardy by refusing to disclose the hazardous chemicals they planned to pipe under your yard? I don’t think you would stand for it. I certainly wouldn’t, which is why I couldn’t just sit by while TransCanada abused our Great Plains friends and neighbors. In response, I launched the nonpartisan “Defend America, Stop Keystone Tour” last fall calling on both presidential candidates to withdraw their support for this dangerous pipeline scheme and to instead begin championing a U.S.-led green industrial revolution. TransCanada knows if they are successful in ramming through the southern (OK-TX) leg of Keystone XL, approval for the northern leg in 2013 becomes all that much more likely. Alternatively, if the American people succeed in blocking construction of the southern leg, we will have likely blocked Keystone XL in its entirety. What TransCanada does not want you to know is that completion of the southern leg alone would open the floodgates to the exploitation of Canadian tar sands by enabling toxic slurry to flow all the way from Alberta’s landlocked mine fields to Texas refineries. This makes Keystone XL a make or break fight. TransCanada, the oil lobby and leaders of both major political parties have disingenuously portrayed Keystone XL as a project that will create tens of thousands of jobs, lower gasoline prices, and promote U.S. energy security. None of these claims are true. To the contrary, Keystone XL poses an imminent economic, public health and national security threat to the United States of America. The poor safety record of Canadian pipeline companies and the economic danger Keystone XL poses to our nation’s food and water supplies are both well documented. TransCanada’s Keystone I tar sands pipeline, built in 2010, leaked corrosive tar sands slurry 12 times in its first 12 months. That same year, a similar pipeline run by another Canadian company spilled more than 1 million gallons of toxic tar sands into Michigan’s Kalamazoo River, sickening hundreds of people, displacing homeowners, wrecking businesses, and destroying jobs. Keystone XL – which would pump tar sands at extreme pressure and temperature across nearly 2,000 U.S. waterways – promises more of the same by allowing for leaks of up to 1.7 million gallons daily without triggering a real-time leak detection system. It is not a matter of if, but when, this 1,700-mile pipeline will compromise America’s breadbasket by contaminating our Great Plains rivers and aquifers. America’s path to prosperity lies in the rapid transition to abundant homegrown renewable energy and appropriate biofuel resources to power our homes, businesses, and vehicles – not in facilitating pipelines transporting the most destructive oil on earth. Keystone XL represents a retreat from the green economy, which already employs 2.7 million workers (more than the fossil fuel industry). To help honestly reframe the debate, we drafted an “Open Letter” (signed by ranchers, farmers, indigenous leaders and other prominent Americans) to Obama and Romney, calling on both candidates to defend America from Keystone XL on economic, public health and national security grounds. In the hopes of inspiring similar actions at Romney and Obama campaign offices nationwide, I then proceeded to hand-deliver copies of the “Open Letter” – via rocket trike – to Romney and Obama campaign offices along the Front Range and Eastern Plains of the presidential battleground state of Colorado, The ride began at the National Center for Atmospheric Research in Boulder and ended at the National Renewable Energy Laboratory in Golden, with a pit stop in Denver for the first nationally televised presidential debate on October 3. I took this stand because Keystone XL is the exact opposite direction we should be headed as a country. It is time for our political leaders to stand up for our basic rights to clean air, food, and water, and to put the health, safety, and economic well-being of the American people before foreign corporate interests. We need a U.S.-led green industrial revolution that will move our economy forward, create millions of new jobs, and help ensure a livable planet for future generations. It is time for a bold vision for the future that is befitting the American people – one marked by innovation, ingenuity, and hope. Join the fight for climate sanity. What I have just described is not a scene out of the science fiction film Avatar. It’s real. The name of the foreign company is TransCanada and their $7 billion pipeline scheme is called “Keystone XL.” Completing this nightmare scenario is an Obama White House already on record supporting the southern (OK-TX) leg of the pipeline and likely to support the rest. It is projected to raise gas prices 10-20 cents a gallon in the Midwest. It may destroy more jobs than it creates and directly undermines the green industrial revolution and the millions of permanent jobs that would create. TransCanada profits, and Americans pay with our wallets, our jobs, our water, our health, our sovereignty and our integrity. It is obvious why TransCanada and big oil companies want this pipeline built. It is less clear why the Obama White House would even consider it. Keystone XL is expected to facilitate oil exports overseas, not the United States. But even if the costly fuel were sold to the U.S., it would only make America more, not less, addicted to the dirtiest foreign oil on the planet. To help bring this about, I led a “rocket trike” tour last fall – in partnership with a broad array of citizens and organizations working to block Keystone XL – along the 1,700-mile pipeline route to draw the nation’s attention to the perils of this project and to support the people in Montana, South Dakota, Nebraska, Kansas, Oklahoma and Texas who are most directly threatened by this dangerous pipeline scheme. If the BP Gulf oil spill taught us anything, it’s that energy companies lie, and pipelines spill, with catastrophic consequences for people and the planet. When talking about actions that will make the planet uninhabitable for humanity, most reasonable people would agree we have passed the point of compromise. The American people are drawing a line in the tar sands, and TransCanada shall not pass. The purpose of the ride was to begin a new national conversation about America’s energy future. I rode to engage the American people in “taking back our power” by demanding a green industrial revolution that will put unemployed Americans back to work, reestablish our role as world economic leader, and help ensure future generations a livable planet. Almost everyone I met on Main Street, America supported this goal.